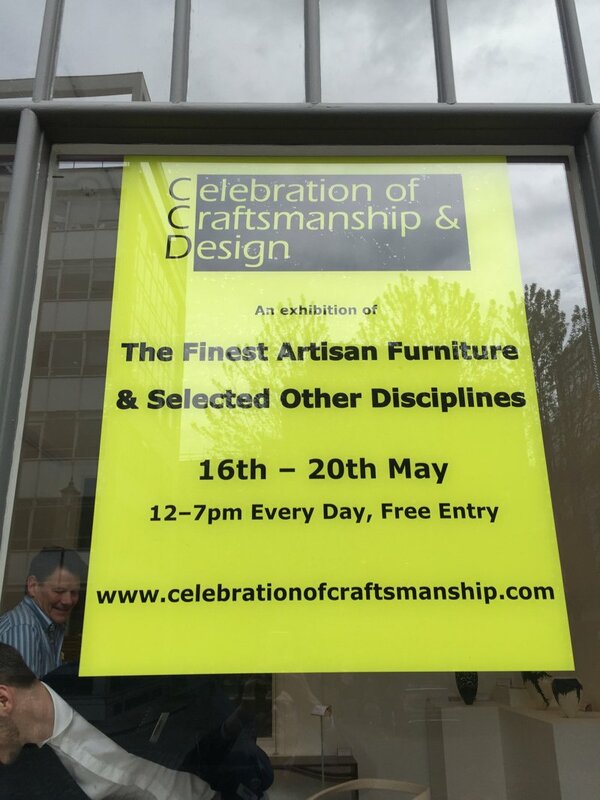 Adam Aaronson is participating in the prestigious Celebration of Craftsmanship exhibition at Craft Central, in London’s Clerkenwell. The exhibition runs from 16-20th May. 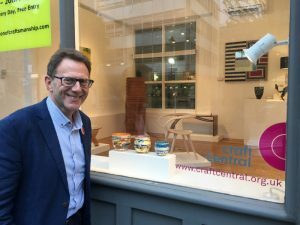 It is open from 12 noon until 7pm every day and is part of Clerkenwell Design Week 2017. 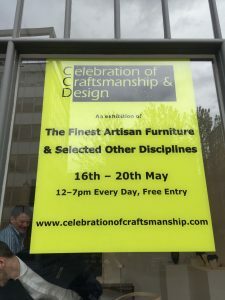 Celebration of Craftsmanship usually takes place in Cheltenham in August. 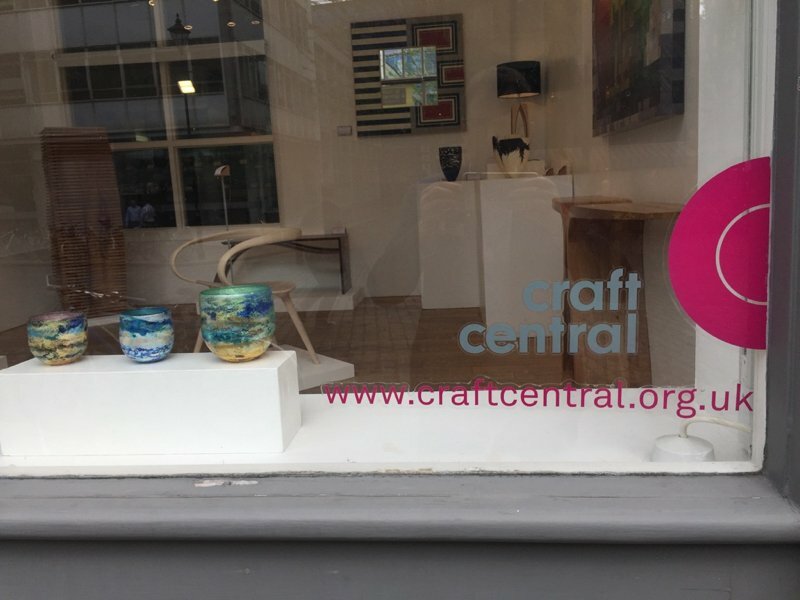 This exhibition at Craft Central is designed as a preview or taster of some of the artists selected for the Cheltenham show. 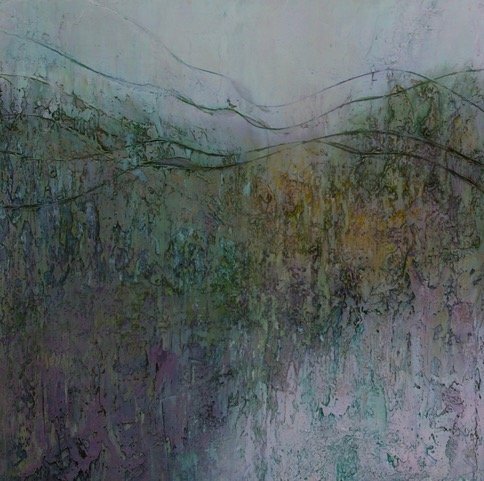 The main exhibiton in Cheltenham is considerably larger than the London exhibition. Clerkenwell is one of London’s largest design hubs. Apparently, there are more creative businesses and architects per square mile than anywhere else in the world. Clerkenwell Design Week celebrates this rich and diverse community. The event showcases leading UK and international brands and companies. 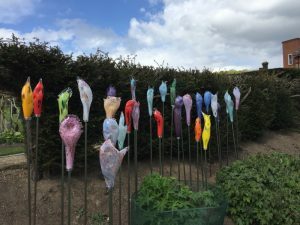 These are presented in a series of showroom events, exhibitions and special installations that take place across the area. 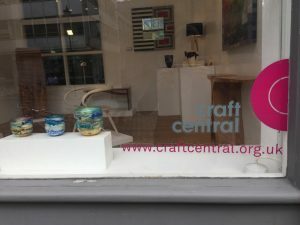 Craft Central, in St John’s Square is located less than five minutes walk from Turnmill Street, where Adam Aaronson’s first studio was situated from 1987 to 1989. 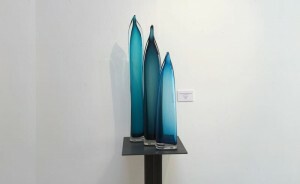 Adam says “It is very exciting to be back in Clerkenwell and to be exhibiting round the corner from my old studio. I found that this brought back many happy memories. The neighbourhood has changed enormously since the eighties and there is much more going on”. Visitors to Celebration of Craftsmanship will find a good selection of Adam’s landscape bowls and vases. 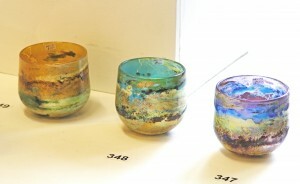 Adam is also exhibitin some of his dramatic new lustre bowls. 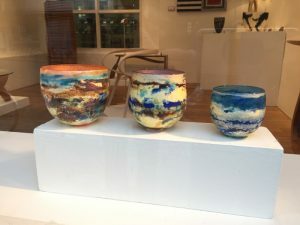 The works displayed are all unique one-off pieces. 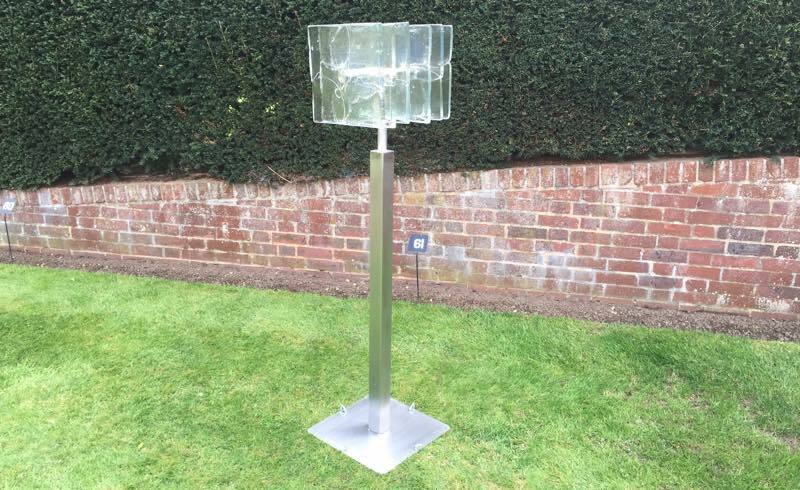 prices range from £175 to £750. 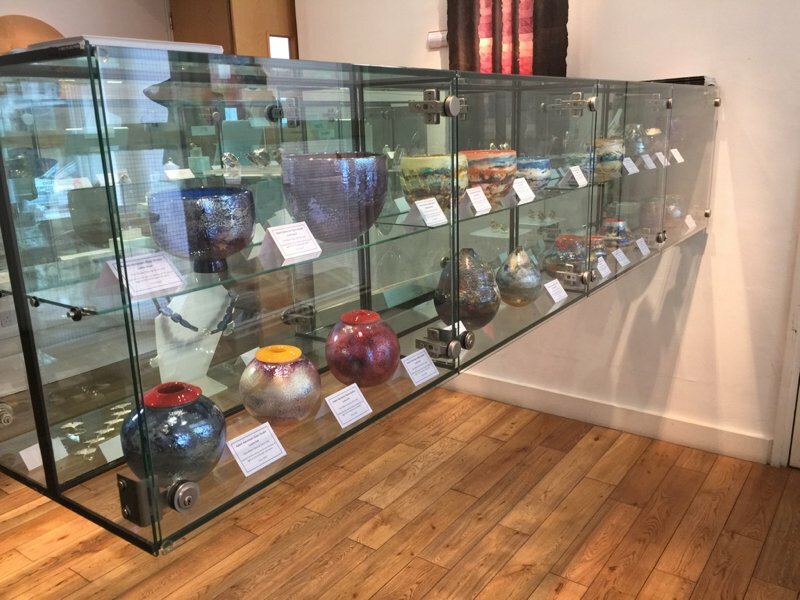 The main Celebration of Craftsmanship Exhibition takes place in Cheltenham during August. 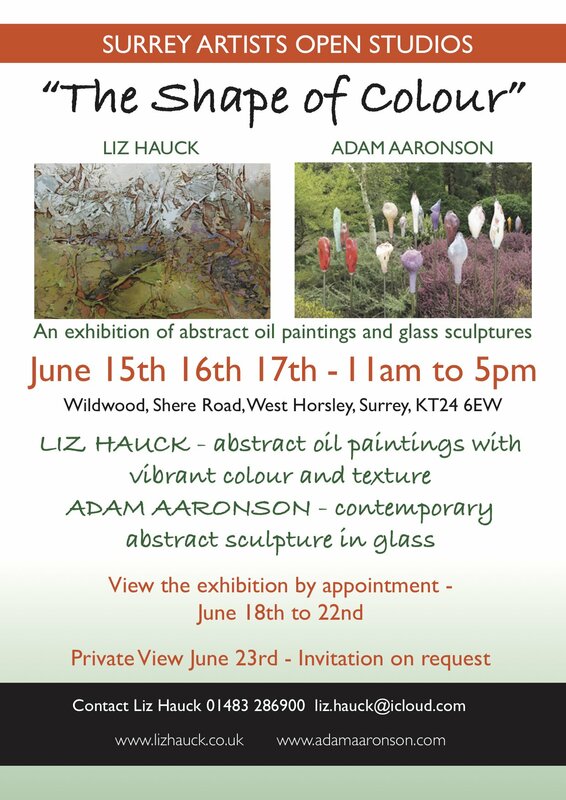 Adam will also be exhibiting there with a wider selection of his work. 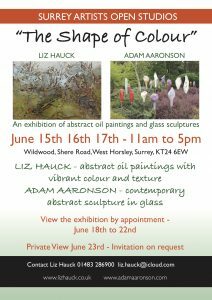 If you would like an invitation to the August exhibition please email Adam. 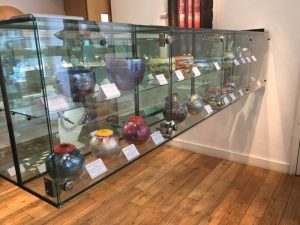 Collectors who are interested in contemporary makers, working in different disciplines, will find that this exhibition is well worth a visit. Adam Aaronson is exhibiting a dramatic Rainbow Glass Rope Bridge at Birtley House. “I often think that all people, regardless of their background, are really just in different phases of a similar metaphorical journey. Each person is seeking the security and happiness, which perhaps they can find at the end of the rainbow. 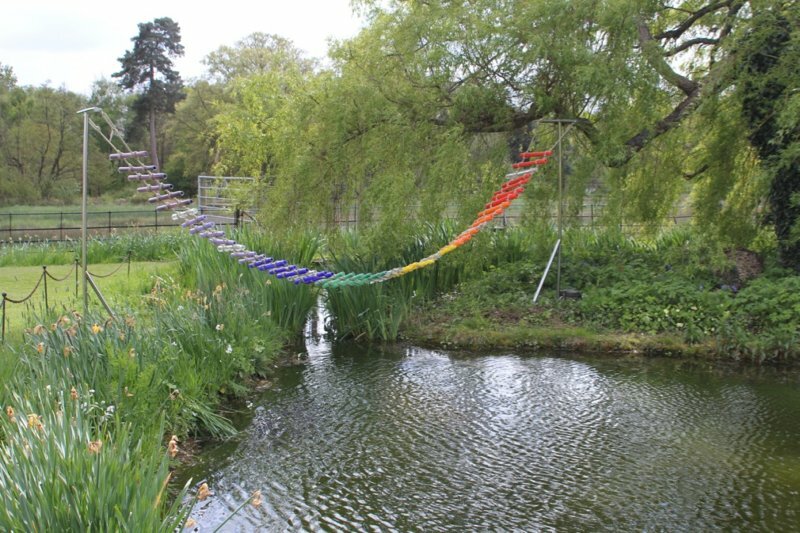 Adam intends his ‘Rope Bridge’, aside from being a dramatic and colourful sculpture, to be an allegory for this journey. Of course the journey is much more uncertain for some than for others. Life is full of pitfalls. 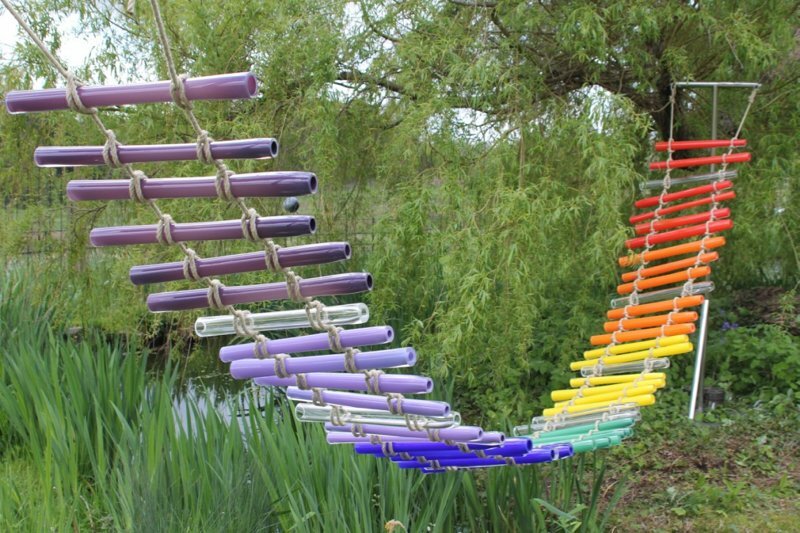 What could be more precarious than a rope bridge made of glass? Adam has installed the ‘Rope-Bridge” at the edge of the lake at Birtley and it crosses the water to an island, which seems like a safe haven. 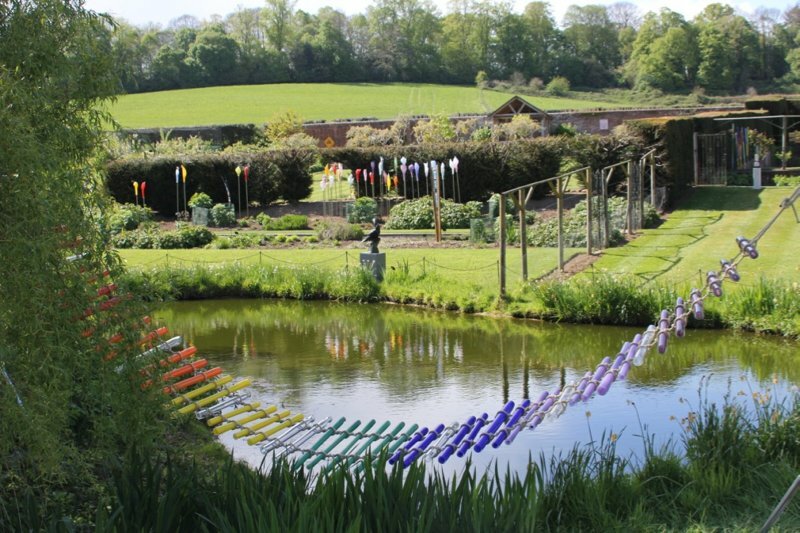 Visitors have commented that the reflections in the water are enchanting. The dramatic “Rope Bridge” comes with the steel supports shown, (not including the weights on the base), however, if you would prefer to consider different installation options, please contact us. For example you could suspend the “Rope Bridge” between two trees. 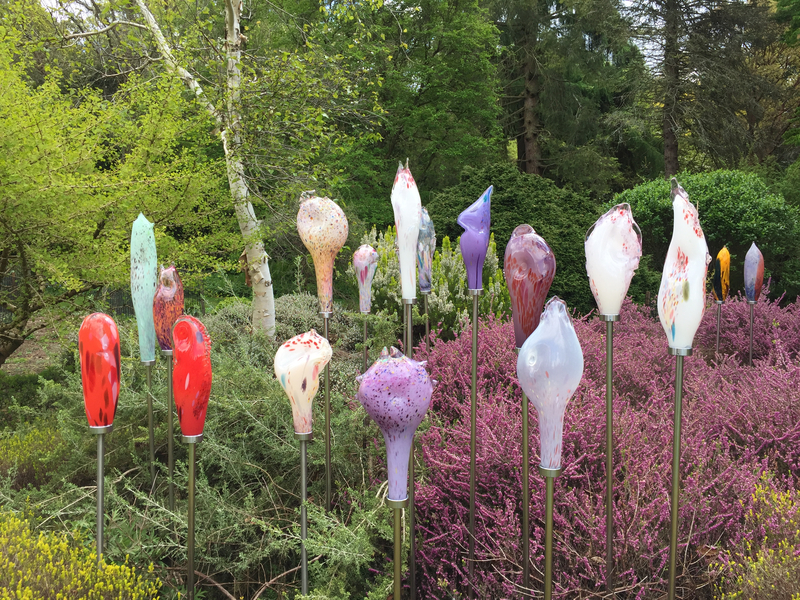 Each glass element has been individually blown. Each tread is approximately 50cm wide with a diameter of around 4cm. 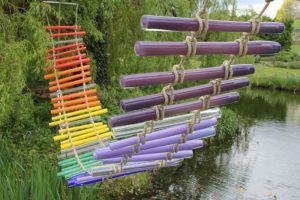 There are 49 elements in this dramatic rainbow glass rope bridge sculpture, including six clear elements. The clear elements, seen from a distance, suggest gaps in the bridge, accentuating the pitfalls in the journey. 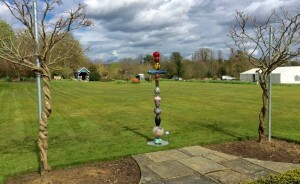 Adam always looks forward to participating in the annual Easter appART exhibition at Priors Field School in Godalming. 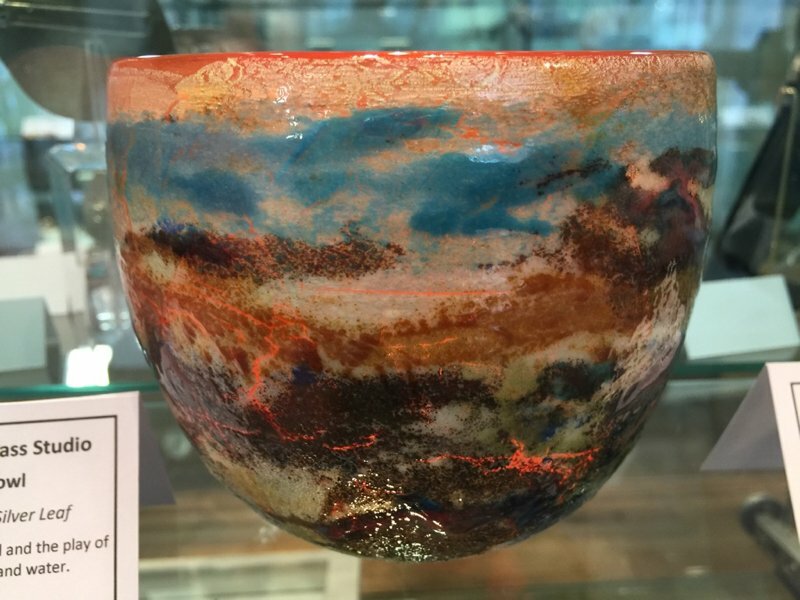 This year is no exception as the standard and range of the exhibits is exceptionally high. The exhibition features work by 200 artists. 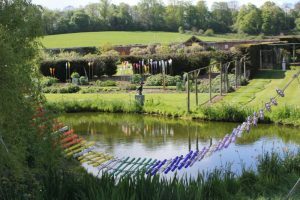 It incorporates a fascinating Sculpture Trail around the beautiful gardens, which were originally designed by Gertrude Jekyll. There is also an indoor exhibition in the beautiful arts and crafts building designed by Charles Voysey. 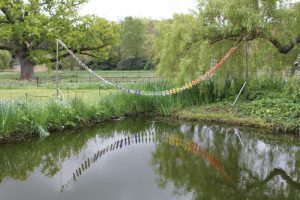 This is a wonderful tranquil setting, and with its rich history, it is an ideal location for an exhibition of this kind. 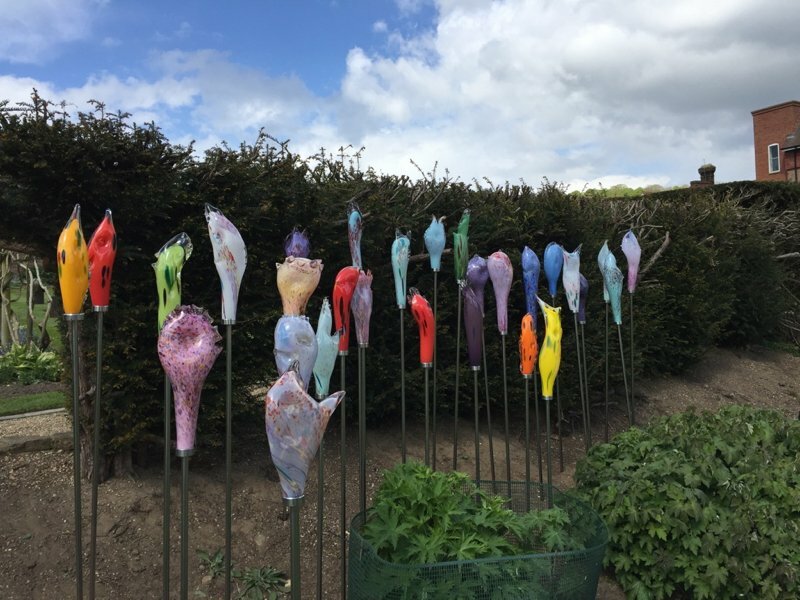 The sculpture trail features a staggering 705 exhibits and the indoor exhibition a further 472, so there is definitely something for everyone. Adam has a several sculptures installed in the grounds and is well represented indoors with some of his most recent landscape bowls. 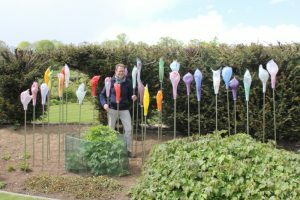 The exhibition was opened on Friday 1st April by Tinx Newton, the Art Editor of Surrey Life magazine. The event marks 20 years of exhibition organizing by the directors of appART, Gwyn and Evelyn Phillips. The exhibition runs from Saturday 2nd April to Sat 16th April 2016 and is open daily from 10am-4pm. Admission is free but there is a £2 charge for the comprehensive catalogue. A visit is highly recommended and you should allow at least an hour if you want to see and study all the exhibits. 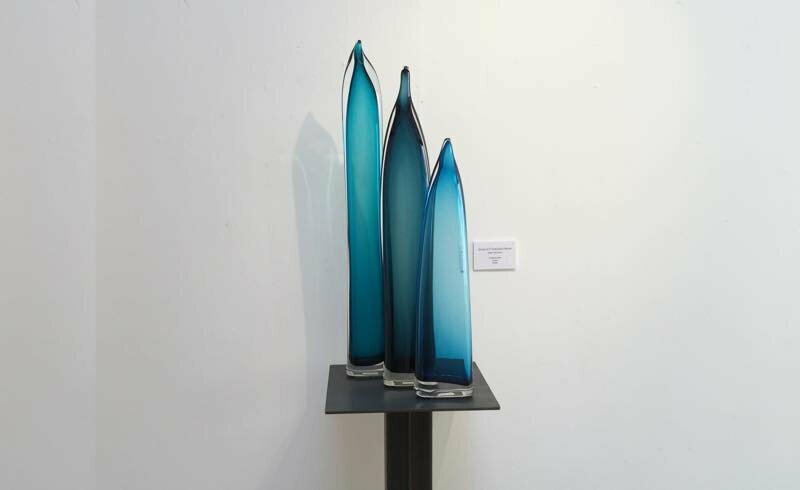 Adam Aaronson Glass at the Mall Galleries. Adam will be exhibiting at the Mall Galleries with the Society of Designer Craftsmen this week and will have a selection of his recent “landscapes” on display. Adam has also made, specially for this fair, a selection of small “beachcomber” and “fresco” vases and bowls with prices starting at £25, which make ideal Christmas presents. There will also be paperweights, birds, elephants and more! Designer Crafts at the Mall opens on Wednesday 16th December and runs through to Sunday 20th December. The fair opens daily at 10am and on Wednesday 16th and Thursday 17th is open late till 7pm. On Friday 18th and Saturday 19th it is open till 5pm. On the final day, Sunday 20th the fair closes at 4pm. There will be a preview from 5pm till 9pm on Tuesday 15th December. Admission to the preview is free and no tickets are required. The Sculpt Gallery Art of Glass Exhibition has now ended. 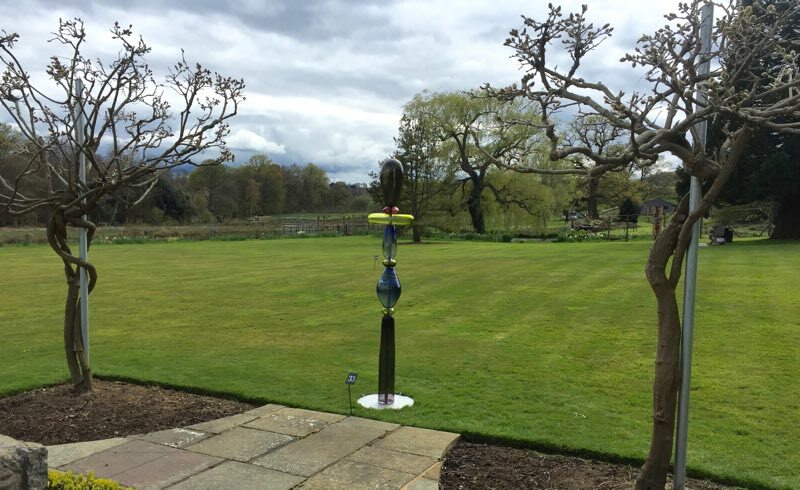 With regular exhibitions and a collection of fine sculpture in the garden, the gallery is an unexpected find in a rural setting, exhibiting high quality, original art by leading and emerging artists from throughout the UK and the region. Established in 2012 by Debra Blik, Sculpt Gallery presents a fresh, contemporary aesthetic. The gallery’s principal artist is international sculptor Maurice Blik, who lives and works on site. If you’d specifically like to see his work and studio please get in touch, before you visit, to avoid disappointment. 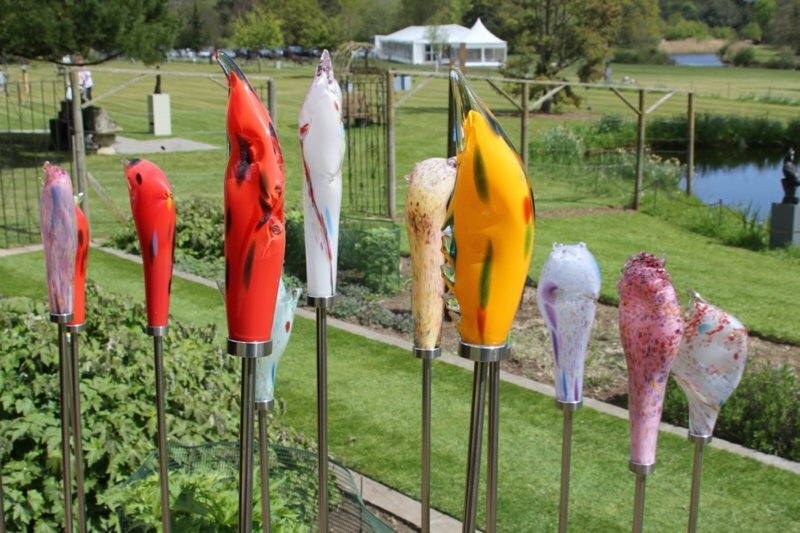 At the Riverhouse Arts Centre Exhibition you can see some of Adam’s “Flame” sculptures. 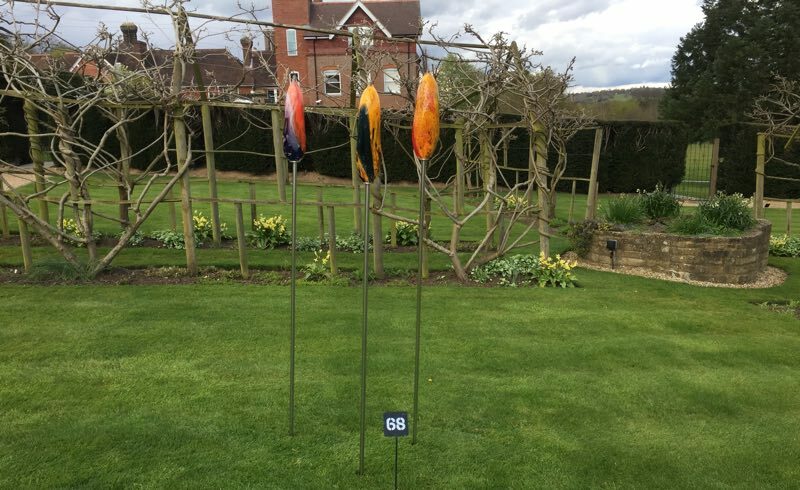 These are exhibited as part of the Surrey Sculpture Society Exhibition at the Robert Phillips Gallery at the Riverhouse Arts Centre in Walton-on-Thames. The exhibition opened on Wednesday 22 July and runs until Sunday 16th August. Adam has three sculptures in the exhibition. 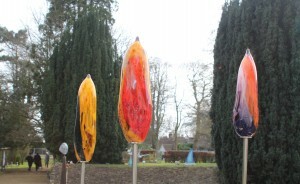 In the main gallery, you can find the group of three turquoise flames shown here. At the foot of the stairs, in the foyer, you will find a group of two amber flames. In the cafe there is a single deep purple flame. The flames are securely attached to a steel base, using unique steel fittings designed by Adam. 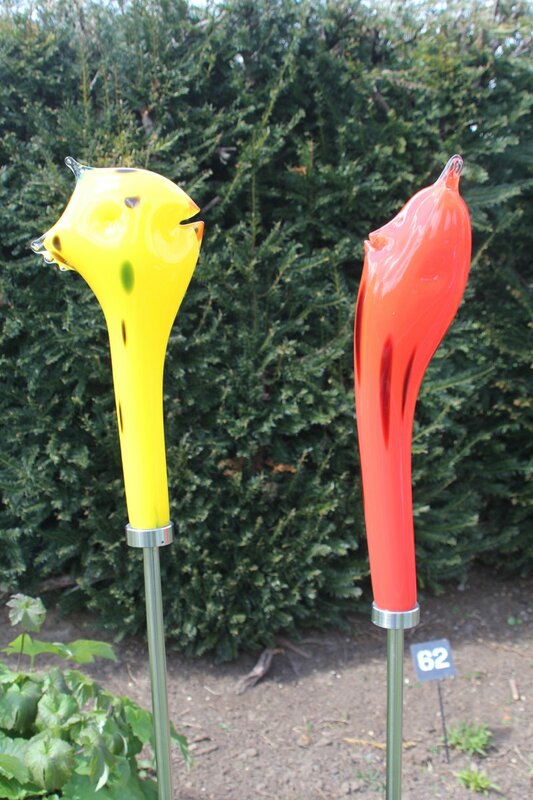 Adam’s “Flame” sculptures developed from his “Stone” and “Sail” series of work. Whereas the stones and sails tend to be small objects up to around 35cm tall, the Flames are considerably larger. 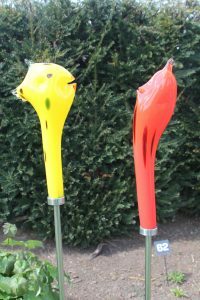 They are usually around 50cm and 100cm tall. 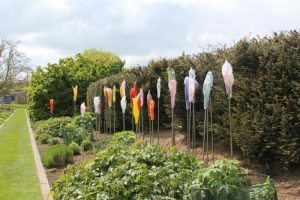 “The flames are really quite massive pieces of glass to have flopping around on the end of a blowing iron. The whole making process is extremely dramatic and requires a good deal of planning and coordination”, Adam says. Recently a group of nine flames were installed by Adam in a private spa in the South of France. 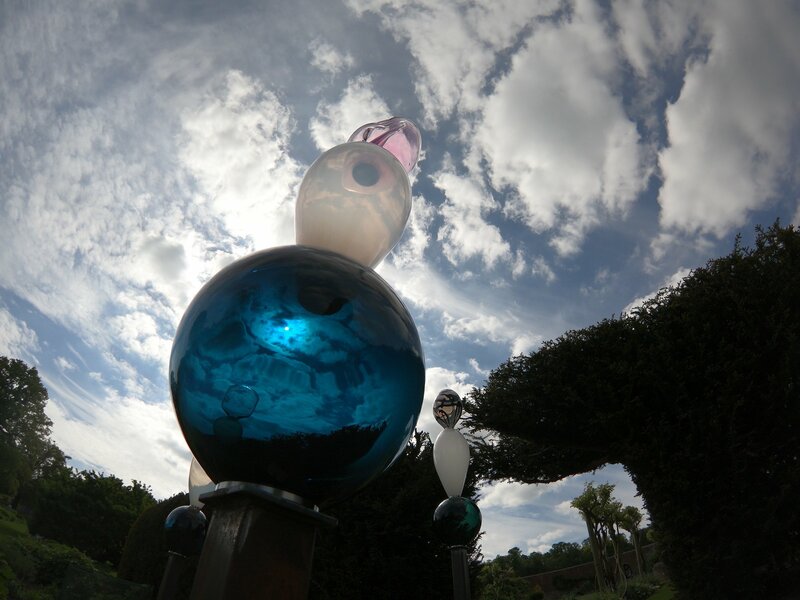 The beautiful transparency of the sculptures perfectly captures the nuances of the Mediterranean light. 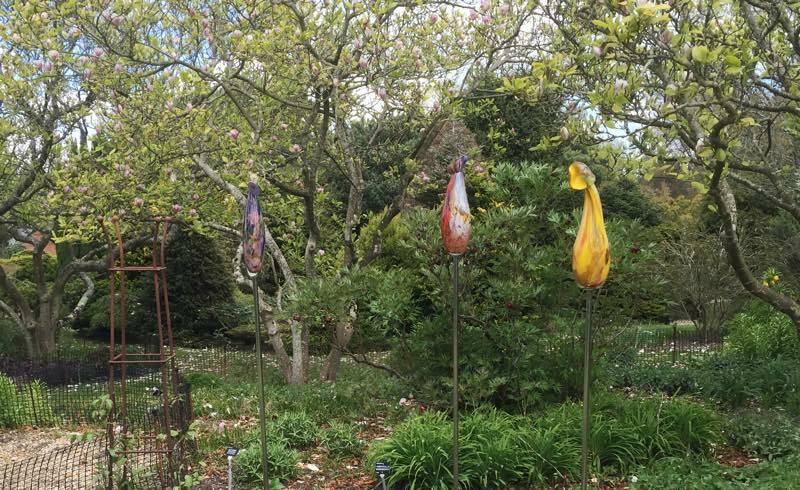 Adam is participating in the Hillier Gardens Exhibition. You can view Adam’s new sculptures on display at Art in the Garden, where you will find some wonderful work by other sculptors as well. 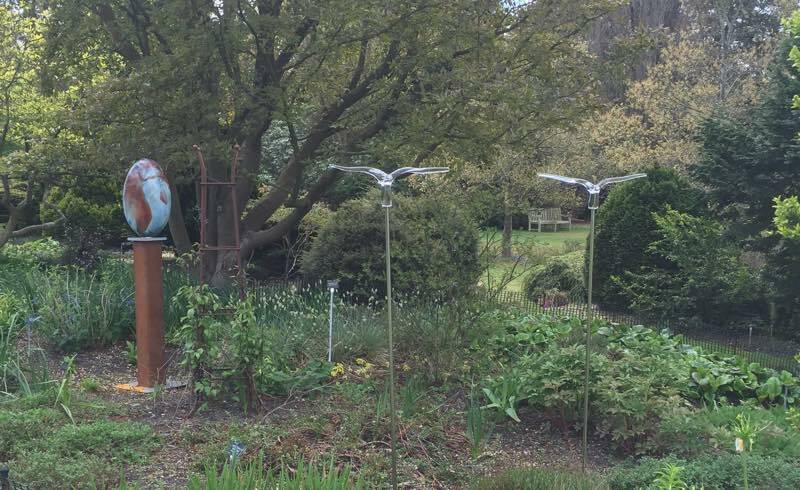 These beautiful new sculptures inspired by birds in flight can be placed in gardens or ponds. You can either display them individually, or in groups of different configurations. 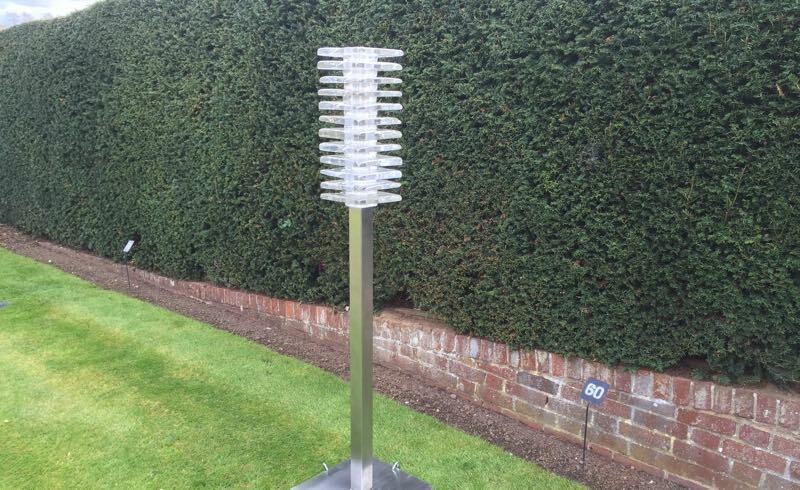 You will also find three of Adam’s ‘Cloud’ sculptures in the exhibition. As well as these he is exhibiting three of his ‘Garden Within A Flower’ series.